Furniture designer Woo-jin wakes up in a different body every day, regardless of age, gender and nationality. Sometimes he’s a man, a woman, old, young, or even a foreigner. He’s the same person on the inside, but on the outside he’s always someone new. Looking at a different face in the mirror every morning is hard for him to get used to. The only constant in his life is the girl he loves, Yi-soo, who knows his secret and loves him anyway. Each time he transforms, Woo-jin must figure out how to reunite with Yi-soo. This is a romantic korean show with a unique concept “normalized” by the subtle yet beautiful images. To think of the same soul or brain or person in a different body everyday, I wouldn’t be surprised to see any power ranger morphing or pokemon evolution effects. Well, the film still got me surprised. Because there is none. The director avoided the topic on how a person could actually change bodies daily. Instead, he focused on the emotional instability of the character “Woo-Jin” under the different bodies and the tedious routine he had to go through every day when he transformed. It was interesting how the team managed to cover the whole wide range of characters that I could think of. In fact, they went beyond and covered more! The film highlighted the perks, of course, when he transformed into handsome guys, and he will be able to get the girls easily. This story was fascinating to me because when I looked at it from an actor’s point of view, having so many people to portray the role of the Woo-Jin, to face different people in the same character everyday is a great challenge. While the good looking guys were eye-candies, it was the actresses who impressed me. Japanese actress, Juri Ueno, touched me with her eyes that said what the character hope to say. Although she was conversing in Japanese, the little actions and looks tell the audience that Woo Jin is in her. Han Hyo-joo is a beautiful lady that guys will love at first sight. It was interesting how she handled the realisation of the guy she thought she knew to be a different person everyday. The peer pressure she had to cope with was immense, and will true love really conquer everything? Can you really love a guy despite of his looks or even gender? This is a difficult question which I don’t think everyone will have the same answer for. The film is based on the 2012 American social film The Beauty Inside produced by Intel and Toshiba, about a man who wakes up every day in a different body. It is Baik’s feature film debut, after a career directing commercials. BAIK confesses that he felt quite a lot of pressure in directing the film as much as he had an enormous admiration for the original social film. But he showed his ability in combining beautiful images and an excellent storyline and completed a heartwarming romance drama of his own. More than 400 actors were auditioned for the role of Woo-jin and 123 were selected from the audition for just one role (including Woo-jin’s montages). Out of the 123, 21 famous actors were engaged to play the Woo-jins at the important moments of the plot. These actors’ talent agents are all in the film as the part of the montages of diverse Woo-jins too. Most of the production staff played Woo-jin in the montage scenes. The 21 featured actors were: KIM Dae-myeung, DO Ji-han, BAE Seong-woo, PARK Shin-hye, LEE Bum-soo, PARK Seo-jun, KIM Sang-ho, CHUN Woo-hee, UENO Juri, LEE Jae-joon, KIM Min-jae, LEE Hyun-woo, CHO Dal-hwan, LEE Jin-uk, HONG Da-mi, SEO Kang-jun, KIM Hie-won, LEE Dong-wook, KO Asung, KIM Joo-hyuk and YOO Yeon-seok. HAN Hyo-joo who played ‘E-soo’ was arranged to be one of the’Woo-jin’ but it never worked out in the end as the actress’ schedule didn’t fit in the shooting schedule. Besides that, Hyo-hoo helped to write the lines that she hope to say to Woo-jin as E-soo. The director accepted her emotions and completed the dialogue that could resonate in the heart of the audiences for a long time. Check out The Beauty Inside (뷰티 인사이드) Facebook Page! 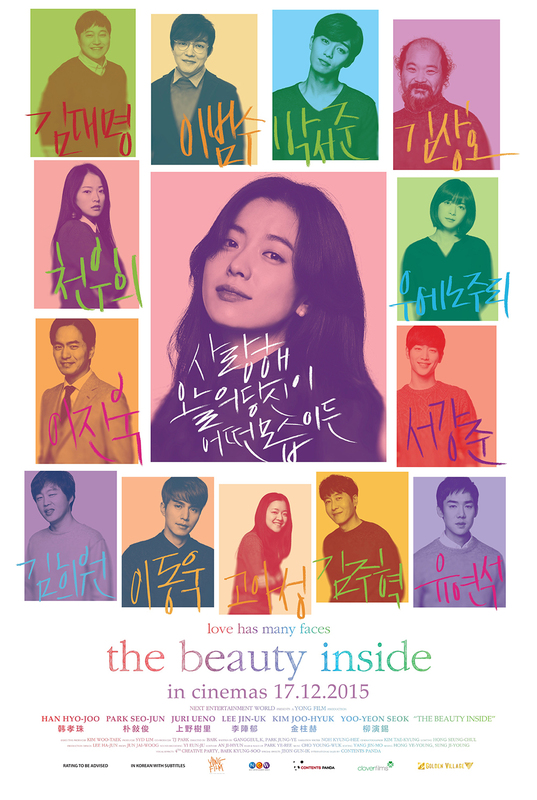 The Beauty Inside (뷰티 인사이드) is out in cinemas on 17 December 2015. I see we got a fan here! Haha… Thanks for supporting this movie! Whoa! The story is so compelling. I hv to watch this movie. Thanks for the review. sounds interesting! looking at the title i thought it’s some plot revolving around plastic surgery or something. oops! gonna check this movie out when i have time! The concept of being a different person everyday can really give you a better idea on life. This looks like a really nice movie with a good story. Looks like a good movie but it’s not screening over here! Saw the trailer in Youtube, this gives me more idea about this. I think I will watch it. It sounds like Adam Sandler’s The Cobbler but more focused on romantic love. It’s really interesting and I would love to watch what happens. Heard about this movie but its not screening here. Probably will try to watch it online. Thanks for the review.